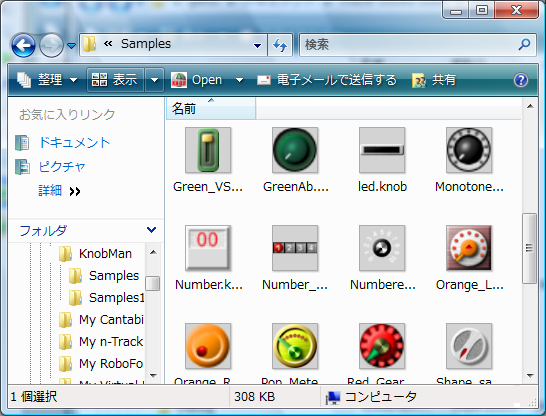 KnobBrowser is a 'Windows shell extension dll' for provide a knob-file thumbnails in Explorer. 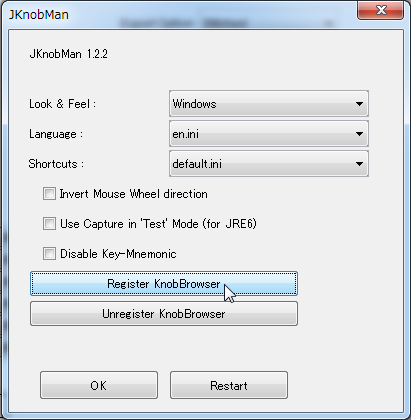 KnobBrowser install and uninstall is controlled by the menu 'File'-'Config...' dialog. KnobBrowser itself is a dll file 'KnobBrowserVista.dll' for Windows Vista or later, and 'KnobBrowserXP.dll' for WindowsXP. it is contained in the folder 'Resource/Support'. Following commands on command prompt also available. NOTE: Unfortunately, KnobBrowser install will not immediately affect the Explorer display because of the complex Windows's cache system. Windows will do thumnailing as a background task and when the thumbnail is available is not sure.